Who is SOUTHERN OREGON SOUND? Southern Oregon Sound is a dynamic chorus of women coming from many local communities in the southern Oregon region. 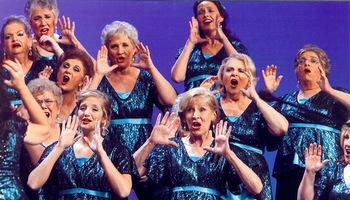 We work toward musical excellence in our sound as a chorus and in the competitive world of women’s barbershop. Education is paramount to us as we strive to improve our sound and also to educate the public about our a capella style. We are located in Medford, Oregon, We love having guests and always welcome new members! Please join us! Rehearsals are on Tuesdays from 6:00 p.m. to 9:00 p.m.
Southern Oregon Sound is a diverse group of women from all over the Rogue Valley. We share the same passion: singing and performing with a high level of enthusiasm, heart and integrity. We are an award winning, driven, fun loving a cappella ensemble, which embraces our community. We rehearse one night a week and perform in venues around Southern Oregon. 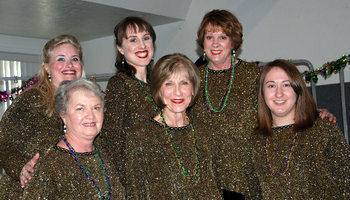 We also compete in Regional Sweet Adeline contests. Our philosophy embraces a commitment to vocal and performance excellence. If you share this ambition, we want you to join us on our journey! Come visit our chorus during any rehearsal.You don’t have to know how to read music or have a professional quality voice to join. We emphasize dedication to vocal improvement. Most of all, we have FUN! Rehearsals are held every Tuesday evening from 6:00 to 9:00 p.m.
Want Southern oregon Sound to sing at your next function? Why not hire Southern Oregon Sound to entertain at your next event? We can perform at corporate functions, charity events, community Entertainment events, birthday parties, christmas parties, awards nights, weddings, engagements, anniversaries, engagements, and even funerals and memorial services.